Producers: Bill Burch, Yvonne King, KingFam Productions, Polly O. Entertainment, LLC. 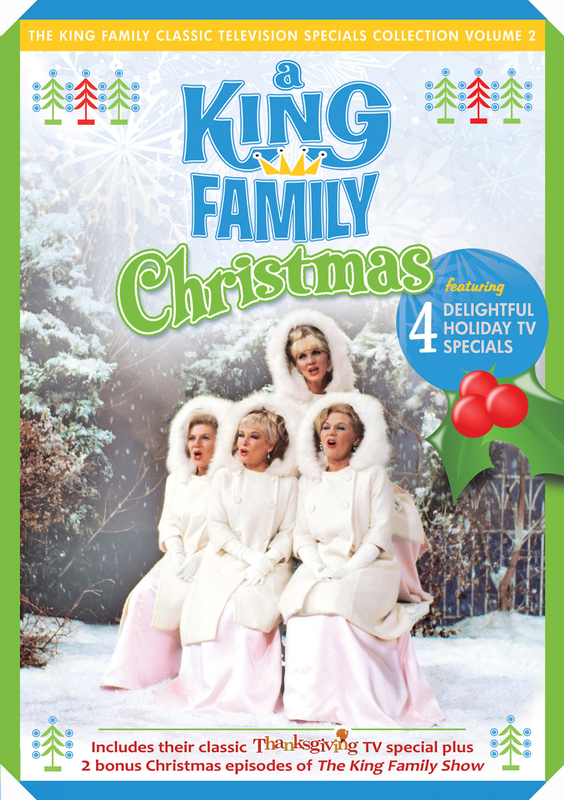 Celebrate the Christmas season family-style with the dazzling, classic holiday TV specials that entertained millions of TV viewers throughout the 1960's & 70's starring multi-generational entertainment powerhouse the singing King Family. Gather your own family for heartwarming performances of beloved holiday hits including "White Christmas," "I'll Be Home for Christmas," "Silent Night," "My Favorite Things," "The Christmas Waltz" and dozens more. Enjoy Grammy-nominated vocal group The King Sisters along with their entire family including guitar virtuoso and Big Band great Alvino Rey, The Four King Cousins featuring Tina Cole (My Three Sons), actor Robert Clarke, trombonist and vocalist Kent Larsen, the delightful King Kids, and all the other cousins, aunts & uncles that made up America's 39-member first family of song. Kick of the season in grand style and join the family in their first holiday special "Thanksgiving with the King Family"(1967), a lavish showcase with all the musical trimmings including Broadway, Pop and Movie hits from Doctor Doolittle, Born Free, West Side Story. Then follow the family in their most beloved specials "Christmas with the King Family"(1967)featuring the surprise on-camera reunion of King Sister Alyce King with her son Ric who was serving in the US Army at the time; "Home for Christmas with the King Family"(1974), a yuletide family reunion featuring three generations of Kings; and the family takes a nostalgic look back and share their memories of the creation of these landmark TV events in their memory-filled holiday public television retrospective "Christmas with the King Family" (2009). 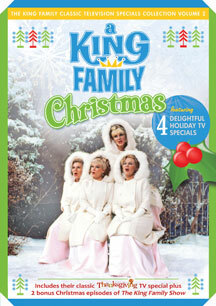 Special Features include multiple musical performances from classic Christmas episodes of the The King Family Show (1965). Make new memories with The King Family this holiday season. A true family affair, A King Family Christmas: The Classic Television Specials Collection Volume 2,combines fabulous music,family charm,& holiday cheer. ...Revives a vital part of the '60s holiday TV-viewing experience. As with the somewhat superior Volume 1, these specials showcase the Kings as real troupers, spreading non-ironic cheer with enthusiasm and heart. Recommended. This DVD is filled with great holiday moments from this amazing family who dedicated their lives to entertaining audiences and making people happy.